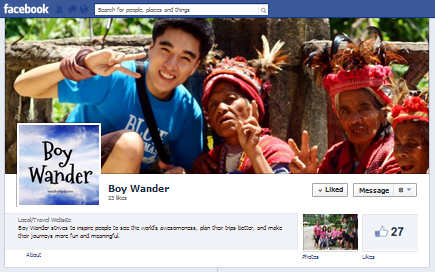 Boy Wander: "Like" Boy Wander on Facebook! MANILA, Philippines — If you're a fan, "like" the Boy Wander page on Facebook! The page aims to reach out and interact with you guys on Facebook. It's also where I'll be posting more photos from my wanderings! Can't wait for our little community to grow!